So the 30th Annual Mid-Ohio Con is all wrapped up, and all of us here want to thank the Columbus organizers for showing us such a great time and all the comic fans that showed up to the con for giving us a chance to entertain them with our titles! More than anything, we want to thank Billy Tucci, Dirk Manning and Steve Scott for being amazingly amazing and chatting with us about the business of comics during and after the cons. 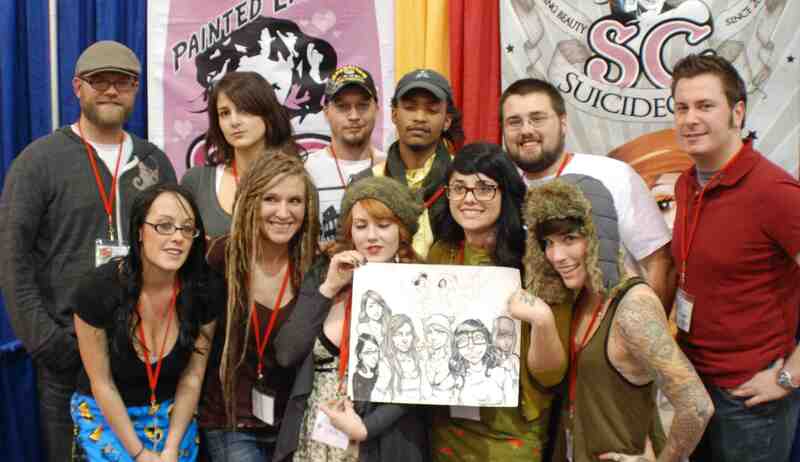 Also thanks to the SuicideGirls and Comic Related for being such good booth neighbors and making this con one to remember. Saturday and Sunday was filled with final set-up details and making sure Rob Dumo and Kristoffer Smith were ready to produce massive amounts of artwork for the comic-loving public. Before long, we had a zombie stop by for a caricature, which began a line of smiling faces that continued throughout the weekend. Beyond that, we continued to fight the good fight and let everyone know more about the titles, and we made out big with the awesome deals we got on singles and trades from con vendors. Exhilarating. Exciting. Exhausting. All these words can be used to describe the weekend, but all in all we had the best time and we couldn’t ask for a better group to accompany us on the journey.